Today is Purple Day. And what is that, you may ask? 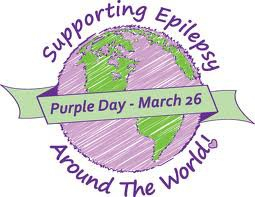 Purple day is in support of Epilepsy Awareness. Wear Purple for Epilepsy Awareness! And in honor of this day, I have a special treat. As many of you know, I have seizures. Last summer, they were completely uncontrolled and we experienced some very scary episodes. One in particular left me in status epilepticus. While in the hospital following this episode, I was in a daze. Keith and my good friend Stefani were there during most of the stay. Although I don’t remember this conversation, Stefani asked what it was like experiencing a seizure. My response: It’s like Wonderland. Many, many thanks to all our wonderful friends and family for giving us permission to use their faces in this video. All of the faces you see here have also lived with seizures. You can learn more about Stefani’s music at Hope Rising. Wow! Love you, Chelsea! Thanks for sharing! Chelsea, so heart warming and terrific. Stefani, your voice is phenomenal.